Corporate water disclosure – the act of collecting data on the current state of a company’s water management, assessing the implications of this information for the business, developing a strategic response, and ultimately reporting this information to stakeholders (investors, NGOs, consumers, communities, suppliers, employees, and others) – is a critical component of a company’s water management efforts and water-related sustainability more generally. Disclosure supports more sustainable management of water resources by improving the ability of stakeholder audiences to evaluate a company’s water practices, make comparisons across companies, and thus foster greater corporate accountability. Improving a company’s understanding of its water challenges and effectiveness of its responses. Providing an opportunity to demonstrate progress and good practice to external stakeholders, thereby improving the company’s reputation and building investor confidence. Establishing a dialogue and building credibility with key stakeholders, paving the way for future partnerships to advanced shared water-related goals. 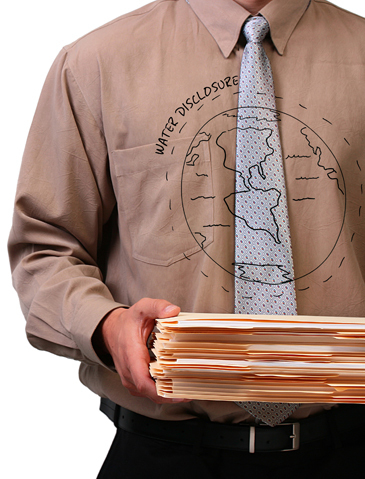 Water disclosure can be applied in a number of ways. It can act as the foundation of a standalone report on the company’s water management activities, serve as a component of broader sustainability reports, inform company financial filings, augment information on company websites, and be a starting point for dialogue with company stakeholders. Companies diverting important resources to complete multiple water or sustainability surveys of varying content. Companies using a variety of different metrics that are not easily comparable, therefore weakening the value of disclosure offerings. Beyond this, current practice in corporate water disclosure (even among the most robust reporters) typically does not adequately capture the incredibly complex and location-specific nature of water resource dynamics and corporate action on this topic. Many companies are therefore looking for practical guidance on how to more effectively disclose the many elements of corporate water management. Read the CEO Water Mandate’s Corporate Water Disclosure Guidelines.